According to NICE, people who are diagnosed with a chronic physical health problem such as diabetes are 3 times more likely to be diagnosed with depression than people without it. 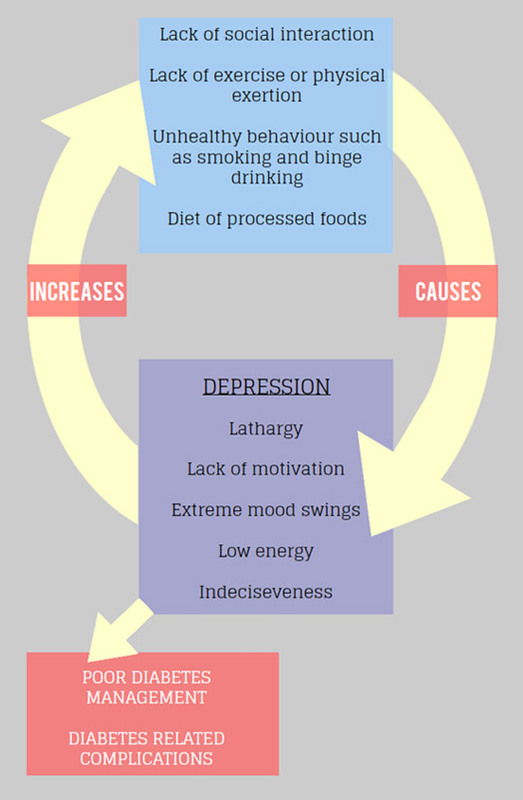 Depression can have a serious impact on a person's well being and their ability and motivation to self-manage their condition. Depression is the most common psychiatric disorder witnessed in the diabetes community. People with diabetes suffering from depression are at greater risk of suffering from an episode of diabetic burnout which collectively can have adverse effects on physical health and potentially instigate more long term complications both to do with diabetes and independent from the condition. A diagnosis of depression is made if many of these symptoms are present, continuously, for a minimum of two weeks. For people with diabetes, dealing with a lifelong condition and managing the risk of complications can seem like an overwhelming task, particularly for newly diagnosed patients. Many diabetics struggle to cope with the requirements, feeling overwhelmed and unmotivated. If diabetes is not faced with an attitude of perseverance and defiance, often depression will prevail. Depression is the perception of life situations as undesirable. Often, when individuals are faced with adverse events or conditions, they spend huge amounts of effort trying to escape or deny such circumstances. Avoiding unpleasantness and expending energy trying to minimize discomfort can cause symptoms of depression. How can depression affect my diabetes? Depression can affect a patient's capacity to deal with their diabetes, including managing blood glucose levels appropriately. Additionally, anti-depressants have been found to have hypoglycaemic effects causing serious problems for self-management. It has previously been reported that depressed people with diabetes are less likely to adherence to medication and diet regimens and subsequently have a reduction in quality of life and increased health care expenditure. Am I more likely to have depression as a diabetic? Yes. According to the National Institute for Health and Clinical Excellence (NICE), people who are diagnosed with a chronic physical health problem such as diabetes, heart disease and cancer are 3 times more likely to be diagnosed with depression than people without these physical health problems. However, this does not mean you will suffer from depression. Furthermore, individuals who suffer from depression may also be a greater risk of developing type 2 diabetes. Depression often goes undiagnosed and untreated, both amongst diabetics and the general population. How can I treat my depression in tandem with my diabetes? The treatment of diabetes is an extremely individual course. People suffering from symptoms of depression for an extended period of time should seek medical advice. There are a number of treatment options, some easier than others but are accompanied by more adverse side effects and potentially toxic health implications, for example anti-depressants. While others treatments are non-toxic and have a health promoting effect, for example Mindfulness, but, such treatments, require a desire to change and be rid of the symptoms of depression. By leaving depression unaddressed, research has shown that additional complications could arise as a result of it being co-morbid with diabetes. One clinical trial for example has found a link between depression in diabetic people and a later diagnosis with the degenerative Alzheimer's disease. Are there other mental health hazards for diabetics? There are many mental health issues that can arise as a result of being diagnosed with a chronic physical condition such as diabetes. Often they will hinder the effective management of the disease, meaning that the patients find themselves in a vicious self-destructive circle. Conditions including bipolar disorder and anxiety disorders are also common in people who have diabetes.